Following their surrender, a group of young Nazi soldiers is forced to clear landmines from a Danish beach. Over the course of their WWII occupation of Denmark, the Nazis planted over 1.5 million active landmines on Danish beaches, mistakenly expecting the allies to make that country their entry point for an eventual land assault on continental Europe. Following Germany's surrender, captured Nazi soldiers were forced to clear the Danish coast of the deadly devices, in an act that contravened the Geneva convention. The Oscar-nominated Land of Mine explores this dark chapter of history. Gruff Danish Sergeant Rasmussen (Roland Møller) is assigned 14 captured Nazis to work on one particular stretch of beach. Unlike the well-trained Nazi bomb disposal unit of Robert Aldrich's similarly themed 1959 film Ten Seconds to Hell, the soldiers in Rasmussen's charge are teenagers with no experience of diffusing mines. After some training, in which the first casualty is claimed, the young men are forced to spend every day on their bellies in the hot sand, picking away at mines with the most basic of tools. One by one, they succumb to their inexperience, the audience greeted with the sight of exploding clouds of sand and grue. As his naive young crew is whittled down, Rasmussen begins to form a bond with the boys, despite his hatred for how the Nazis have treated his country. Land of Mine will likely play best to those with minimal knowledge of history. Ignoring the fact that it essentially asks you to sympathise with Nazis, it's one of the tensest movies imaginable, simply by way of its premise. I can't deny I was on the edge of my seat watching its protagonists perform their incredibly dangerous task, but not because the film had made me care about these young men - I was simply preparing for a loud bang, like the child extra in North by Northwest who famously sticks his fingers in his ears well ahead of a gunshot going off. Land of Mine is one of the most disingenously manipulative films to come along in recent years. For a start it never refers to its protagonists as Nazis, rather Germans. Aside from a throwaway remark from Rasmussen's unsympathetic superior about "You know what they've done," there's no discussion of the exact role these young Germans played in the conflict, nor of their level of commitment to the ideals of the Nazi regime. Every evening, their day's work completed, the boys are locked into a cabin, but the film never gives us a glimpse into what they might discuss in their bunks, away from their Danish superior's ears. None of the boys seem to have any opinion on their plight, neither expressing resentment at their country's capitulation nor remorse for their atrocities. This is because this film is determined to have us sympathise with these young men, an endeavour that would be immediately scuppered were it honest about their recent past. Instead, we're shown how the young men love animals (just like a certain A. Hitler), or how they place their faith in crucifixes, in contrast to the Godless Danes. Conversely, Rasmussen is initially portrayed as a brute. When we see him first he's administering a severe beating to a young Nazi whom he finds in possession of a Danish flag. It's an admittedly shocking image, but it's difficult to condemn his actions. I was reminded of the recent footage of American Nazi Richard Spencer being punched in the face by a protester, and how most decent people cheered on his attacker. I may be a pacifist, but I'm not going to condemn anyone for punching Nazis. A major problem with Land of Mine is how unconvincing its central scenario is. Would a single, middle-aged Sergeant really be left in sole charge of 14 trained young killers? And why wouldn't said trained killers simply murder him and take off for the border? Let's face it, they've surely committed worse acts. The film also implies that the Danes were happy to see the Germans killed by their own mines, which makes no logistical sense, given there were a mere 2,000 prisoners to dismantle 1.5 million devices. The real elephant in the room however is the question of what alternative resolution there might have been to this scenario? Modern bomb-detonation technology wasn't available, so the only solution was to have the mines taken apart by hand. Surely it's only right that the Nazis be assigned the task of clearing up their own cowardly mess, rather than the innocent Danes? 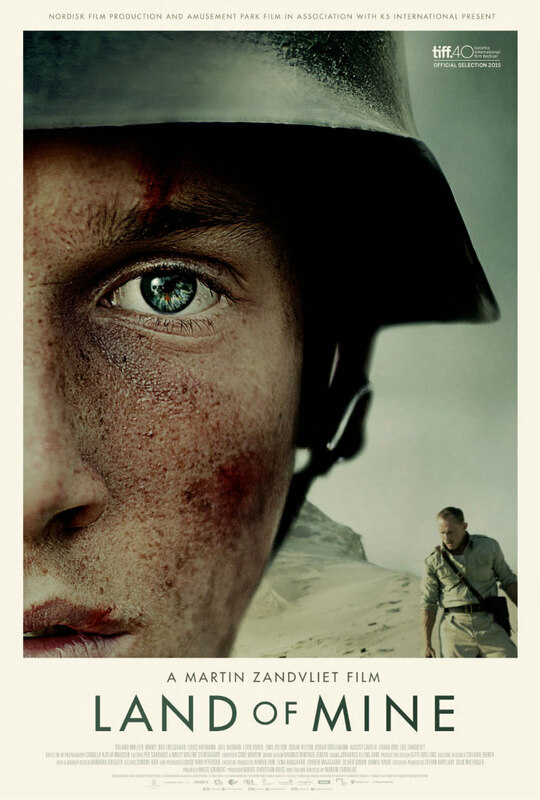 As exercises in self-flagellation go, Land of Mine is little more than a technically well made piece of victim blaming propaganda. Land of Mine is in UK/ROI cinemas August 4th.